Hakkasan Abu Dhabi Festive Menu is the perfect way to ring in the New Year. Hakkasan Abu Dhabi’s Festive Menu is designed to be shared! Featuring a mix of Hakkasan’s award-winning signature dishes and seasonal ‘one-offs’ the highlights include Braised Superior seafood soup with black truffle, Festive steamed dim sum platter, Jasmine smoked crispy chicken and Honey panna cotta with green apple sorbet. Hakkasan Abu Dhabi Festive Menu is AED 588 per person (minimum two people) inclusive of a non-alcoholic, AED 688 per person (minimum two people) inclusive of a welcome cocktail and wine paring and 888 AED inclusive of a welcome cocktail, wine pairing, and Champagne. Available from 8:30pm to 1am on 31st December, celebrate the start of 2018 with Hakkasan Dubai’s opulent New Year’s Eve menu. Guests will sample a selection of the restaurant’s best Cantonese dishes including Crispy taro and pumpkin cake with chicken floss and dry chilli, Stir-fry Australian Wagyu rib-eye beef with red wine and jackfruit, Charcoal grilled Chilean seabass with bean crumb and king soya sauce and Chocolate orange bar with kumquat sorbet. Hakkasan Abu Dhabi New Year’s Eve Menu is 688 AED per person (minimum two people) inclusive of a welcome non-alcoholic cocktail; AED 888 inclusive of a welcome cocktail and wine pairing; and 1088 AED inclusive of a welcome cocktail, wine pairing, and Champagne. Available on 31st December 2017 only. Located in the landmark Emirates Palace, Hakkasan Abu Dhabi is the ideal location for any festive or New Year’s Eve party. Guests can chose to dine in the atmospheric main restaurant or book one of the four private dining rooms for a more intimate celebration. 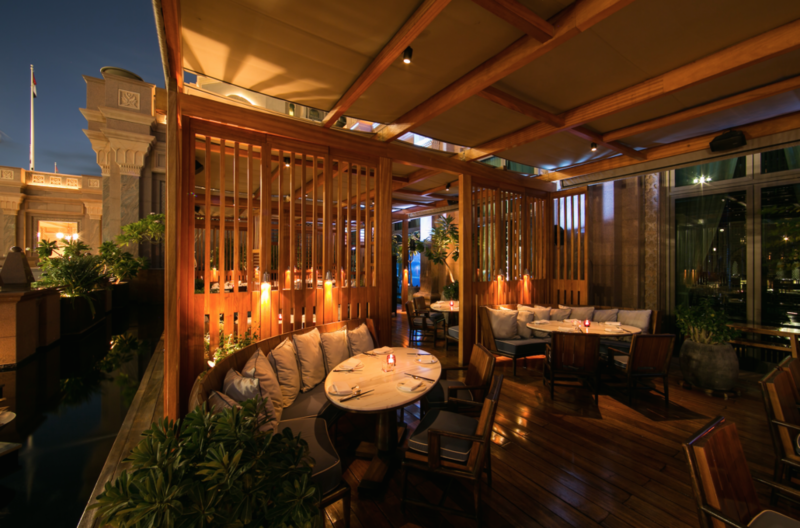 For those wanting to dine alfresco, Hakkasan’s terrace offers breathtaking views of the city skyline. For reservations, please email hakkasan@emiratespalace.ae or call +971 2 690 7739.